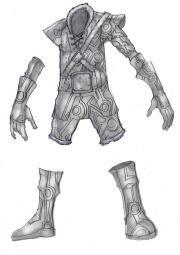 Halfling travel clothes double as armor, and as such are chosen as much for their comfort and flexibility as for their ability to absorb physical blows. For some halflings, travel clothes might mean whatever they slept in, but most choose some form of durable leather. It is not unheard of for some of the mountain clans to wear metallic armors, but even with metal comfort is valued. They prefer the lightest of chain shirts or, at the most, flexible metal scales. Seldom is a halfling seen wearing a plate armor, especially since most halflings lack the strength to wear heavier metal armor effectively.